Although you’ve probably sent e-mail before, you might not be familiar with the ins and outs of using Windows Live Mail. 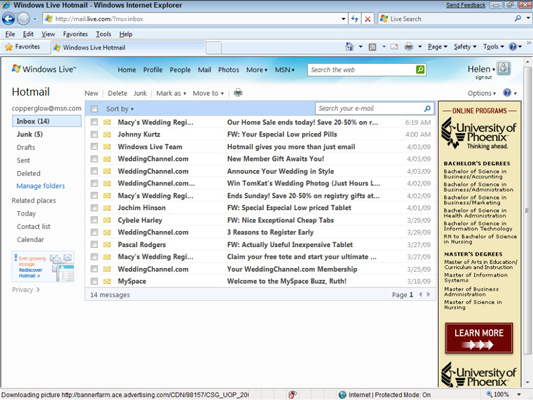 Windows Live Mail allows you to receive your e-mail messages from any computer that’s connected to the Internet. E-mail is the cornerstone of online communication, and with Windows Live Mail, you can keep communicating anytime and anywhere. Windows Live Mail (or just Windows Mail) used to part of the Windows Vista and Windows XP package. Now you need to either access it online or take an extra step and download it to your computer from the Windows Live Web site. Once it’s installed, you can access it directly from the Start menu. 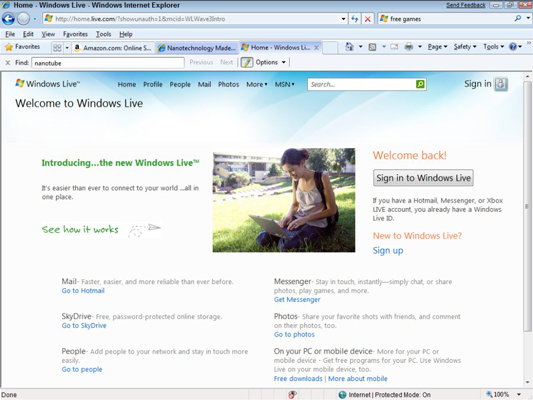 Go to the Windows Live home page using your browser. Windows opens your default browser and displays the Windows Live sign-in window. If you need to start a new account at this point, click the Sign Up button and go through the sign-up procedure first. Once you’re set up go back to the sign-in window. Click the Sign In to Windows Live button and enter your password in the field that appears, and then click the Sign In button. Windows Live automatically sends any messages that are waiting to go out and receives any new messages. If your mail doesn’t come through, your e-mail provider might be experiencing technical problems. Just wait a little while. If you still can’t get mail, contact your e-mail provider to find out what the problem is and when it will be fixed. Click the Mail link at the top of the page to view your Inbox. New messages sport a small closed envelope icon; those with attachments have a paper clip icon. If a message has a little exclamation point to the left of it in your Inbox, somebody has flagged it as urgent. It’s usually best to check those e-mails first! To organize messages in the Inbox, click the Sort By button and choose any of the categories, such as From (to sort the messages alphabetically by sender), Subject, Date, and so on.